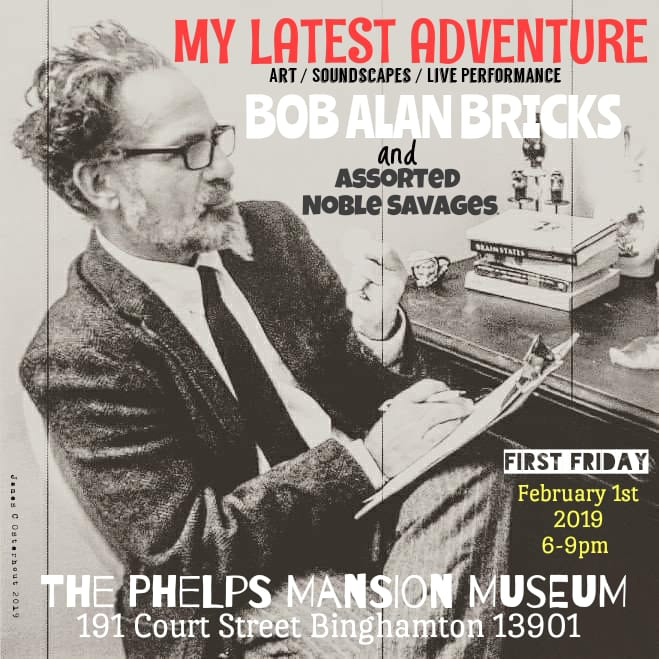 Provided by Visit Binghamton Artist Bob Alan Bricks will put on a performance installation at the Phelps Mansion Museum this weekend. This Friday evening, the Phelps Mansion Museum will be hosting a live art experience directed by local artist Bob Alan Bricks and featuring performances by a troupe of other collaborative artists known as “Assorted Noble Savages.” The event, entitled “My Latest Adventure,” will feature a variety of different art forms, including painting, collage, sound and poetry. Bricks has become a fixture in the Binghamton area with his unique, experimental art that does not subscribe to any particular style and makes use of any and all mediums according to his fancy. He began creating art as a young child and was influenced by his grandmother to begin painting, eventually engaging with different art forms. Bricks worked in advertising and then devoted himself to raising his children, and since retiring, he has fervently returned to his work, which consists of both visual arts and sound. Since 2015, he has had more than 25 exhibits throughout the Binghamton, Owego, Vestal, Endicott, Johnson City and Scranton, PA areas. Bricks’ work can be in the form of paintings or collages depicting images culled from the recesses of his imagination. Bricks himself does not always know their significance, and delights in leaving the interpretation open to his audience. Joe Schuerch, house manager of the museum, said the event will be open to the public and students of Binghamton University are welcome to attend. Bricks said the event comes after much anticipation to create a uniquely interactive art show that shirks the conventions of traditional art shows. Consequently, Bricks will also be presenting experimental soundscapes, running in the background of the exhibition while his troupe of so-called “Noble Savages” perform various artistic acts. He is encouraging attendees to come in costume to reinforce the atmosphere of peculiarity.